A kids' cookbook with easy recipes for healthy, wholesome, and fun dishes to inspire cooking adventures, kitchen confidence, and food appreciation. MOLLIE KATZEN is a cookbook author and artist who has profoundly shaped the way America eats. Mollie is a consultant and cocreator of Harvard's groundbreaking Food Literacy Project. She lives in the San Francisco Bay Area. "Ms. Katzen, who also wrote 'Moosewood Cookbook,' has a good sense of small children’s powers and limitations, and sensibly recommends planning cooking sessions “for in-between times” when no one is hungry enough to get cranky." 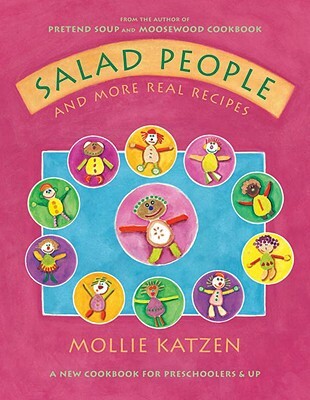 "Mollie Katzen’s cookbooks for preschoolers, Pretend Soup and Salad People, are works of child-friendly genius. . ."
"...Katzen offers another gold-standard collection of vegetarian, kid-friendly recipes in an artistic, innovative format."